There were 12 of us as students in the Friday morning 'Open Studio Painting' class at the Brisbane Institute of Art (BIA) when our then tutor, Paul Milburn, encouraged us to stage our first exhibition in May 2010 at the Gallery Nona (now known as the Metcalfe Gallery). We called ourselves the 'friday 13 studio painters' with Paul making up the 13. We've exhibited as a group since then and have retained the name, modifying it slightly to the 'Friday 13 Group'. Over the years the membership of the group has changed very little with only a few moving on and others joining. Since Paul's death in 2011, we have continued to paint as a group untutored on Wednesday afternoons at the BIA studios. 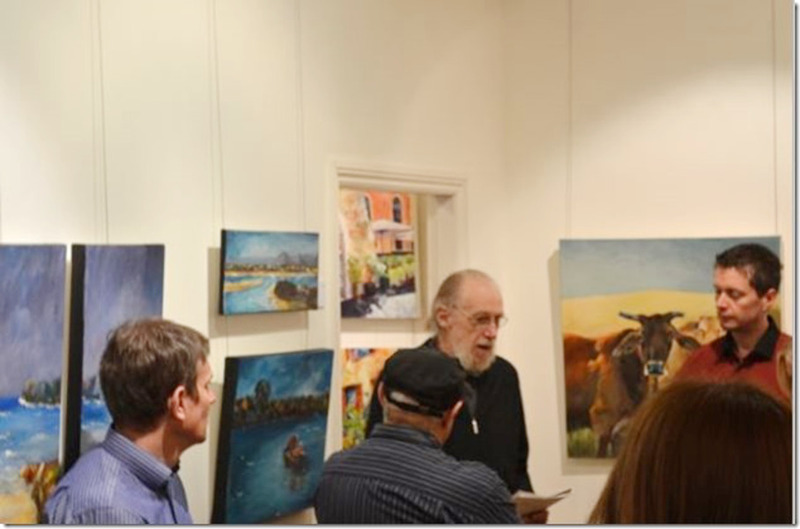 We are a group of artists of varied backgrounds who have been students at the Brisbane Institute of Art over many years, some stretching back to the 1980's, but in the main since about 2006. Our individual styles and subject preferences vary and have evolved over the time we've been together. Painting with a group of friends is wonderfully stimulating (and fun), and we find that the support and encouragement it provides has enabled us to improve and develop as artists. Many of our group regularly enter painting exhibitions and competitions, in South East Queensland and nationally, and have received numerous awards and commendations.